As many of you know, the drugs that are currently labeled for the prevention and treatment of American and European foulbrood will no longer be available for over-the-counter purchase beginning January 1, 2017. The decision by the US Food and Drug Administration to tighten control over antibiotics is a response to the ever declining list of antibiotics that actually work. Overuse of medically important antibiotics has led to resistant strains of many pathogens that affect both human and animal health. The new regulations will restrict the use of antibiotics that enhance growth in livestock. In addition, veterinary oversight will be required for certain drugs used to treat diseases in livestock, including honey bees. From a public policy standpoint this type of restriction is long overdue. The indiscriminate use of antibiotics is rampant, and important drugs are often used even when they are not needed, leading to the resistant pathogens which are cropping up everywhere, especially in hospitals. In spite of the good that can come from this legislation, as a beekeeper I wonder what the potential impact may be. Many, many beekeepers use Terramycin (oxytetracycline) to prevent or suppress American foulbrood (AFB) or European foulbrood (EFB) in their hives. In addition, some use lincomycin or tylosin for treatment. All of these drugs will soon become unavailable without a prescription. Both of these brood diseases are highly contagious among honey bee colonies and the only non-drug “treatment” for AFB is burning of the infected hives. We don’t see much AFB these days, and I wonder if that is because it is disappearing or because it is being suppressed by drugs. I know of people who purchased nucs from beekeepers who routinely suppressed AFB such that symptoms never appeared. But when the innocent purchaser didn’t continue the suppression, the disease reappeared in short order. What these stories suggest is that AFB is alive and well and about to make a comeback. Since drugs like oxytetracycline will require a veterinary prescription, I speculate that the incidence of infected hives will increase. As a result, people like me, who have never given much thought to AFB, may suddenly be hit with it. Simply put, those beekeepers who were suppressing AFB kept it from spreading. Those suppressors left many small-time beekeepers pretty much free of the disease. Although I’ve never treated for it and have never seen it in my apiary, I wonder how long that will last under the new system. As with other diseases, absconding bees, drifting bees, swarming bees, robbing bees, lost bees, and drones can all carry the disease. Since foulbrood does not affect adult bees, they can easily carry it wherever they go. I further speculate that the reappearance of AFB and EFB will not happen immediately. I suspect that beekeepers who have been using the drugs are stockpiling, so for a while, at least, we won’t notice a large uptick in cases. But as stockpiles disappear or lose their effectiveness, the incidence of disease will rise. And once your hive becomes infected, how easy will it be to find a veterinarian who is willing to diagnose your hive and prescribe treatment? And how affordable will that be? I really do have mixed feelings about the new laws. Yes, they are most likely a good thing. But with all the problems honey bees face, perhaps we need an exception. Should we be allowed one easy-to-get drug for the brood diseases? I assume that not all beekeepers with AFB will burn their hives or go to a vet. Instead they will try to keep their bees alive, spreading the pathogen far and wide while their colonies collapse. If nothing else, beekeepers should be aware of this potential new problem and be on the lookout for symptoms. Beekeeping is tough and every day seems harder than the one before. Knowing what I know now, would I do it again? I wonder. Update (9/24/16): A recent statement in Catch the Buzz has caused much confusion among beekeepers. The FDA “final rule” will allow beekeepers to mix and administer an antibiotic to infected colonies without being licensed. However, in order to purchase the antibiotic, the beekeeper must obtain a prescription from a licensed veterinarian. The antibiotic may only be prescribed for control of AFB or EFB and not for prevention. This “final rule” may still not be final because the comment period is still open, but as it stands now, beekeeping antibiotics will be prescription only. If a remember correctly, a bacteriophage is a virus-like thing that attacks a bacteria? That is cool. How do those get delivered? If I get foulbrood, it will likely end my days as a beekeeper. I don’t make money off my bees so I have no way to justify the expense of a vet. Let alone trying to find a vet who will come diagnose my hives. I have not had to deal with it so far and hopefully my isolation from other beekeepers will keep my hives free of disease. A friend had a documented case of AFB… After being treated with phages the infected hive recovered… The rest of the test was half of his hives were treated, the other half were not treated.. None of the treated hives developed an active case of AFB.. And all of the untreated hives developed active cases of AFB. Treating these hives was too late for one hive, but the rest recovered. That is awesome. I wonder how far in the future bacteriophage therapy is. What are the signs that a colony is suffering from AFB? AFB is a bacterial disease that causes the brood to liquify and rot. Usually the first sign is a horrible smell, as if something died a while back. I once saw a hive that had fewer than 10 infected cells, and I could smell it twenty feet away. A field test is usually done by inserting a small piece of wood (matchstick size) into one of the liquified brood cells. If you twist it around and pull it out, the liquified material makes a long string like a rope. If a hive has ropey cells, a sample is usually sent to a lab for verification. I love the strategy of using a virus to kill a bacteria. Viruses/phages are so specific, and though resistance to the virus is possible, viruses can also be modified, or will evolve to continue their efficacy. Have you had any success so far? I know that in the early part of the 20th century, the Soviets used viral therapy for a number of communicable diseases. Hi Rusty, it’s probably more daunting than it sounds. In NZ we are not allowed to use any antibiotics in our hives. We have to do an annual inspection and declare that the hive is AFB free. If at any stage you find it then the hive and the gear has to be burnt. You may see a spike initially but I would suspect it would settle to the point that it is more than manageable. Here in New Zealand we do not have European foulbrood nor do we have the small hive beetle. I’m sure they will arrive though hopefully not for a very long time. We have had AFB for a bit over 100 years and the only thing we can legally do is burn the affected hive including honey. As we are a comparatively small country in theory we could eliminate it completely. Rusty you are so right in saying some will do nothing about AFB and subsequently infect other hives. We have more than enough of those ratbags. In New Zealand antibiotics are not permitted to be used in beehives (law for the last 100 years) AFB is a notifiable disease and all hives must be inspected by a qualified beekeeper at least once per year, we burn infected hives at a rate of about 0.25% per year. An education system is in place. Rusty, I live in a bee-dense area which is also flooded with pollination bees every May/June. This is the first year I have not had brood disease in my apiary. Less drift this year? Maybe some of the farmers passed up paying $20,000 for pollination?? I note the treatment free apiary nearby has finally died out, whew. I have dug up one reference to Varroa vectoring EFB, and if they can do that I suspect they can vector AFB as well. I share your mixed feelings: at least some of the big local pollination operations medicate prophylactically and all the time, driving resistance, and remaining probable reservoirs of disease. I sure want them to stop that practice, although they are adamant this will destroy their business model. Maybe they need a new one? In my second year I bought nucs from a fellow club member who fibbed and said they were from his mountain apiary. Turns out the little gems were from a big local pollination yard and of course were that yard’s medicated culls. They were slow to expand and in my new-bee ignorance I did not know that was really bad. Turns out they had EFB, which infected half my apiary that year…I ended in quarantine and having to medicate during the honey flow, so no honey for human consumption that year. As bad as that was I did better than many other local beekeepers who bought these nucs (turns out he sold scores of the things) as many also got AFB as well. Incredibly my club member remains a club member. But it really woke me up. I breed my own bees now. “I note the treatment free apiary nearby has finally died out…” Whoa. That didn’t take long. It seems they only set up a couple of years ago? Here in Sweden you are not allowed to treat AFB so there is only burning. Outbreaks are pretty uncommon though. 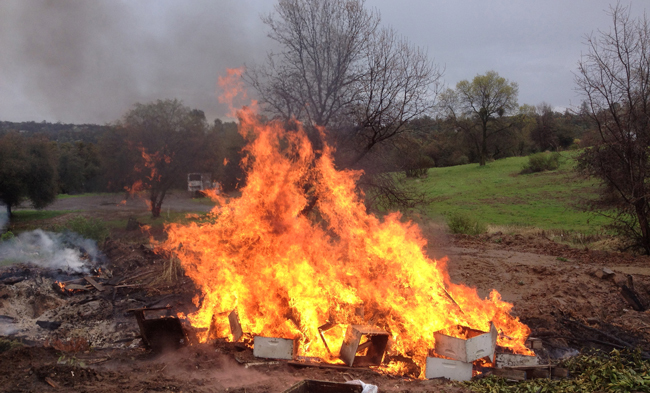 I am able to sign up for an insurance that compensates the economic aspect of burning your hive and bees. We had some AFB in the Netherlands last season, relatively close to where I have my bees, which was a little scary. It is mandatory to report an incidence of AFB here, an older beekeeper told me there are fellow apiarists who just don’t report on an incidence of AFB because all the hives on the apiary will be cleared. He also told me he knew of a way of treating a colony for AFB. He said you had to put the colony in a mesh box and leave them there until bees start to die from starvation. He said that because the disease lives in the gut of the bees, when there is no more food in the intestinal tract of the bees the disease will be gone also. I have no clue on the efficacy of this method, nor have I heard of it from any other source. So perhaps this is just some rambling from an old man but I don’t have enough experience to judge on it’s merit. Just thought I’d mention it. I’m thinking that when Sandra Hope from BYU came to a club meeting, I believe she said the rights to market have been sold. I think it is waiting Fed approval. To apply you spray on a liquid with phages on the affected gear. As the phages (a virus) infects the AFB bacteria it reproduces itself many times over till the threat is gone. The phages are extremely bacteria specific and occurs naturally in nature. Phage therapy is an old science, but was put on the back burner…no I think they pushed it completely off the stove when antibiotics became popular. That is fascinating! Thanks so much for the info. It will be interesting to see how the approval goes. Reaction to Andrew (from the Netherlands). The old man wasn’t rambling at all. It’s a technique, a method that is recommended when you’ve found or catched a swarm of a unknown origin. To be sure that this swarm is or becomes AFB or EFB free you keep this swarm locked up in the dark in a temporary box or hive and this for at least 3 days. After these 3 days you’ll notice that the very first bees are dropping dead because they are dying now from starvation as all their [food] reserves have been all consumed now. Also their guts have become empty and therefore clean because of lack of any new food, meaning that they have also excreted/secreted all the infestation spores together with their stool. This technique/method can also be used when a colony is slightly infected by AFB or EFB. Therefore the original hive is put away a few meters from its original place. This has to be done in the evening, at the beginning of the twilight. Now the empty place is taken in by an empty but clean and healthy box or hive. Then all frames are shaked off in front of the [empty][fake] hive, after the queen has been found and locked up at first. When the bees are entering their [empty][fake] hive she can be released on the entrance shelf. When all bees are in and night has fallen you can remove this temporary beehive which now can be seen as an “artificial swarm”. After 3 full days in the dark they can be given a new home, meaning a clean and healthy beehive, with clean new frames in it, each provided with a brand new wax foundation. And this new hive should be be placed far away from the infected area because you might get a new infection/infestation easily! Then you start feeding them immediately with a light warm sugar syrup 1:1. Here in the UK there are no licensed antibiotic treatments for bees. The only treatment for AFB is burning the hive. In fact we have a legal obligation to notify the authorities if we find AFB and the hives will be destroyed if confirmed – there’s no other option. It sounds very harsh and I would be absolutely heartbroken if it happened to my bees. Still I think most people would agree that this policy probably benefits everyone as cases of AFB are mercifully rare here. Membership of the British Beekeeping Association also includes insurance to compensate you a little if this happens. I am dealing with a case of European Foulbrood myself. I took two infected frames to my local veterinarian who knew nothing about honeybees. However, based on my explanation, she gave me the needed prescription at no charge — asked for a jar of honey, which I will provide. This is my first such case ever, and it is daunting to say the least. I am not sure if this hive will make it — put robbing screens on this hive and its sister (a few feet away), and the second hive has remained disease free for now. Thanks, Honeybeesuite for all you do! I recently made a donation to support your work. Thank you, Sarah. I’m very curious about how the foulbrood thing will play out in the future. I’m also sure that many veterinarians will be caught of guard by these Rx requests because it’s something they never had to deal with before. By the way, the robbing screens are a good idea.